Hebrews Chapter 11 is one of my favorite chapters of the Bible. It talks about the Old Testament heroes of the faith, of Abel and Enoch and Noah, of. Of Abraham, Isaac and Jacob. Of Joseph and Rahab and many others. It talks about the bold steps each of them took because they trusted God and believed what they could not yet see. And, what's more, sometimes they believed what they never would see. I don't know about you, but that's sometimes hard for me to comprehend. These people lived by their faith. They have stood for thousands of years as our shining examples, our faith heroes, and yet they did not receive the things God Himself had promised them? How could that be? Did they do something wrong? And yet, looking a little further, we see that the whole thing is merely a matter of perspective. They saw these things not in view of the tiny glimmer that was their mortal lives, but from God's perspective and in the light of eternity. 14 People who say such things show that they are looking for a country of their own. 15 If they had been thinking of the country they had left, they would have had opportunity to return. 16 Instead, they were longing for a better country—a heavenly one. Therefore God is not ashamed to be called their God, for he has prepared a city for them. More than anything, tiny Reepicheep wants to go into Aslan's country (the Narnian equivalent of heaven). Ever since he was a mouseling, he has longed for it more than any honor or adventure he can find in his own world, even though it's abundantly clear that honor and adventure are of utmost importance to him. And, when he is at last given the opportunity to go to Aslan's country, he happily flings away his sword, knowing he has no more need of it, and sails away, like Enoch being taken away so that he never experienced death. 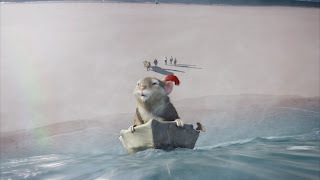 As flawed as the recent Dawn Treader movie is, especially in telling the spiritual parts of Lewis's tale, one thing they got absolutely right was the look on Reepicheep's face as he leans eagerly forward in his little coracle, catching the wave that takes him forever out of sight. In spite of my best efforts, that moment always brings tears to my eyes. It perfectly captures that longing in my heart, too. I can understand his eagerness for that better country where everything makes sense and faith becomes sight. There are many things that I have believed for and felt very clearly that God has promised me, but I haven't seen some of them. I don't know if I will see them before I die. But I know that His promises are true, and they will come to pass in His time and in His way. All I need to do is trust in Him and live in a way that He is not ashamed to be called my God. Are there things you're believing for that you haven't yet seen? Who are your faith heroes? I LOVE Reepicheep and I was so sad that they missed out Caspain's Order about engaging in single combaet with it. Thpugh it spite of all the failings of the films I would rather have my little niece getting into the Narnia stories than a lot of other things. I think one aspect of Jewsish religion that I have always admired is the expectation of the Messiah. This existed from the very beginning, and it is suggested that those who believed in the one day to come final redeption of the Meddiah even in Old Testamaent days. One of my Jewish freinds says that this is the REAL meaning of the verse that talks about baptising for the dead. It is effectively confirming faith the your righteous ancestors. Such a great post DeAnna! I'm excited because I'm picking up the audiobook at the library today (Narnua) as I have found them all available from another library. Your words have really helped me see this in a new way. Thank you! I love Narnia, and I love this post. I can clearly see Heaven and Jesus in these books, and got teary-eyed in many parts. Thank you for this post, DeAnna. My favourite Faith hero will always be Ruth. I know she 'just followed orders' but I want to rise to that attitute with Jesus - a place where I go and do what He bids without question or argument. Yes, Anna, I don't know why they left that line out of the movie. It's just one little line, but it's SO telling and so funny. And I agree about the movies. I'd rather see them, flaws and all (though I think they got LWW almost perfectly right) than something else. I wish they had been as faithful to the books as the earlier (technically rotten) BBC versions. Oh, Deb, did you get the unabridged audios? The ones I have are read by Patrick Stewart (THE best) and Kenneth Branagh (also completely wonderful) and Michael York (wonderful, too) and I can't remember who else. They are absolute greatness! I'm with you, Suzie. I get to the end of The Last Battle and I want to cry. Not because it's sad (I don't think it is), but because I don't want it to end. I want to GO. Lewis was just especially blessed in his writing to be able to paint such pictures. Yeah, sorry, Anita. No gun toting rancher wimmen in Narnia. I guess part of the appeal for me is the medieval English feel to the whole thing. But there's so much there that speaks to my spirit, too. I just never seem to tire of it. "Foreigners and strangers on earth." Love that. I guess I'm still waiting for some of the words the Lord gave me about my writing to come to fruition. Great post :) For Teen Bible Quiz, we are quizzing over Hebrews and the Peters, this year and the other day I just got done memorizing Hebrews 11. I never thought of Reepicheep and his longing for a better country, that's a great way to draw it out! It really helped me visualize it :) Wonderful post. I'm not sure who is narrating my audiobook but it better not be a condensed version! Anna - the whole 'rights' thing is so confusing, but you've got me thinking I'll go take a peek in cyberspace and find out more. I follow CSLewis Daily on Twitter. Someone posts a quote or line from a book. I admit some of them are Way Deep. Wow. Nice reminder. I think the one promise that I await is his coming. When times are difficult, I often find myself humming, "Someday, my prince will come." It's got me wondering if those old fairy tales of long-awaited princes were really symbolic of the rapture. Nope Narnia doesnt have any Gun totin' girls, but it does have bow an' arrow wieldin' girls, and there is always at least one courageous female herione in each story. Whoever said C.S.Lewis was sexist? Still ladies dont have to be gun totin' to protect thier property, medieval women could be very tough, some of them had to protect the castle/manor/farm when thier husnands were away. I love the whole manner of the characters in the books, so well spoken and polite. No offence meant to the people here, but I felt that the movies were a little too 'Americanised' sometimes. Eustace Scrubb was so great in the last film though, just as I would have imagined him in the book. I got my Info from the internet, I think it was Narnia Web or Middle Earth.net. I really dont understand the 'rights' thing either, but I think they couldnt get things worked out in time, that and the movies not doing as well as they liked. Ah, well there is The Hobbit next year, and that movie about the Battle of Hastings if it ever comes out.